As with so many things on LinkedIn, the issue arises because people want to use the site in different ways and so something which one person finds of value, another might consider to be a waste of time or better suited to a site like Facebook. And so it is with LinkedIn Notifications. So the challenge we face is how to get the best out of them and to avoid the annoyance that people feel that they are in some way irrelevant and intrusive. Luckily, and again like so much on LinkedIn, you can customise this section allowing you to see the ones that you are interested in and hide those that for you are simply irrelevant noise. Notifications do very much what they say on the tin – they simply notify you when something which is deemed of interest or importance to you happens. You’ll find them in the main menu and they appear for a number of very different reasons. Basically it makes you aware of a huge number of really quite important opportunities to engage with others on LinkedIn, exactly the reason that we (or at least most of us) are on LinkedIn in the first place. So as I hope you’re beginning to see, notifications can be a very good thing rather than an intrusive pain in the ‘proverbial’, but you’ll need to ensure that they are working for you in the way that you want them to. For me (and how I use LinkedIn), engagement is the name of the game – essentially talking to people, when you strip it back to basics. 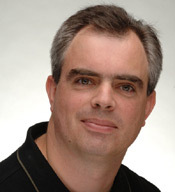 In my LinkedIn workshops, I always present the analogy that LinkedIn is like a big room full of all sorts of people. I need to identify and target the ones I want to talk to – to know when one of them is talking about me or when someone I have worked with is referring to something I have done for them is absolute gold dust. That’s exactly what notifications can deliver – a great source of information about who, how and why people want to engage! The issue arises though because we all work in different ways and so not all notifications are relevant to us all. 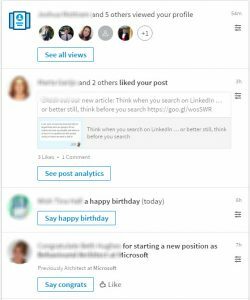 Personally, I don’t start wishing my connections Happy Birthday just because LinkedIn tells me to. It’s not that I’m a grumpy old bugger (well, maybe sometimes), it’s just not me. 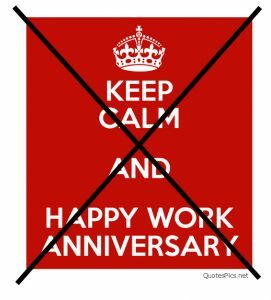 Likewise, I tend not to indulge in wishing people Happy Work Anniversary either – for many people though, they love to do this. Each to their own and I’m certainly not going to knock that. All I do is ignore or turn off the ones I don’t favour, allowing me to concentrate on the ones I do. … and a whole host of other relationship building reminders and actions. After all, in that big room analogy I talked about earlier, if you were mid conversation with someone, you wouldn’t just walk away without answering them would you? Hhhmmmm …? If you are still unconvinced, then knowing how to turn them off might be a useful piece for me to add here. It is actually very easy to turn off the notifications – they can all be managed directly from the Notifications tab and will allow you to determine which types of updates you’d like to receive and which you’d prefer not to. 1. 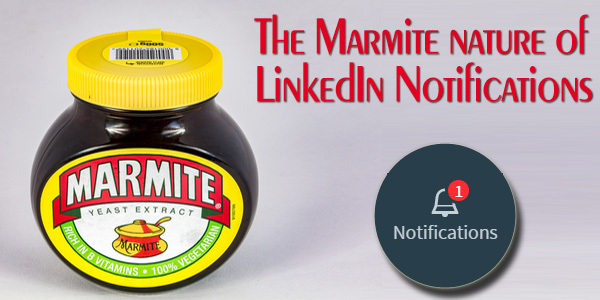 Click the Notifications icon at the top of your LinkedIn homepage. 2. Click the icon to the right of the notification. 3. Select Turn off all notifications of this type. Once you’ve turned off a notification update, all existing notifications for this type will be removed from the Notifications tab and you’ll no longer receive these alerts. You can find a list notification updates you’ve turned off, on the Notifications tab … and should you regret turning them off, then you can reverse the process from here too. The aim of this post was to inform you about the options that you have – however, as I mentioned earlier in the article, the only person who can decide which set up is best for you, is YOU. From my perspective, I leave them all on – I do, however, ignore the vast majority of happy birthday and happy work anniversary announcements, though I could turn them off if truth be told. However, I pay very close attention to new job announcements and will often congratulate my connection about the move (with a personal message, not the default of course). I also follow carefully the conversations I’m engaged in and those where I have been mentioned – all give me opportunities to thank those taking about me and to help those looking for help using LinkedIn, thereby raising my own visibility. I would encourage you to think about what would give you most benefit too. And as an aside: if you share the post on LinkedIn then I should be notified and it gives me the chance to comment or thank you for that if appropriate. Now, what could be nicer than that? This entry was posted in Advanced LinkedIn, LinkedIn Advice, LinkedIn Strategy, LinkedIn Tips and tagged LinkedIn Advice, LinkedIn Business strategy, LinkedIn Notifications, LinkedIn Tips. Bookmark the permalink. ← Don’t connect on LinkedIn!